LOVELY looking cake and I LOVE that part of Cornwall. Lovely, fancy that dragonfly landing on CT’s knee. I love those flowers in the jug. Gorgeous pictures there, a pity the weather wasn’t kinder to you. 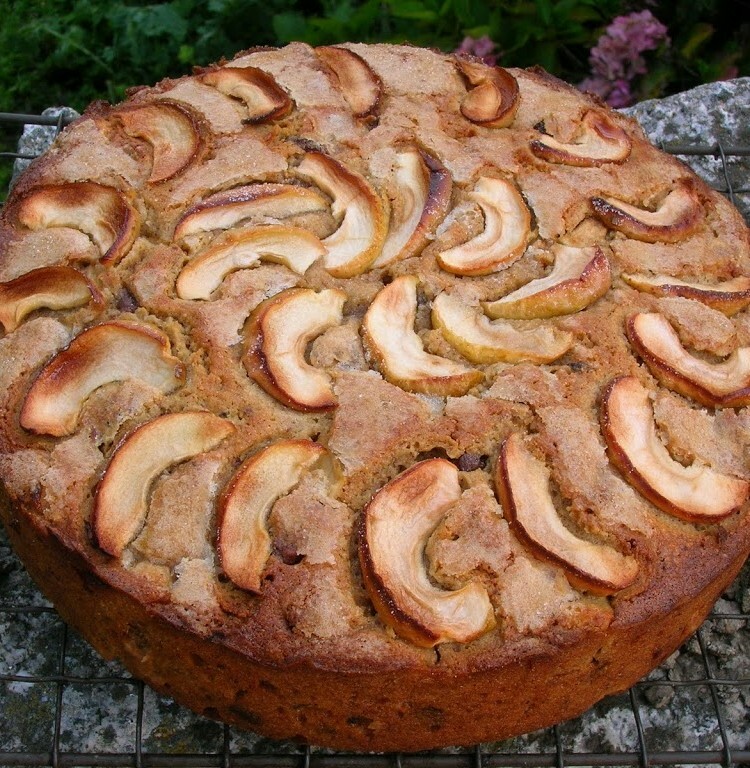 It sounds like a fabulous early autumn cake, making the most of all our seasonal bounty! It looks like a lovely holiday! And a beautiful cake. What a stunning looking place. The beautiful colour of the water contrasting with the jutting rocks makes me want to sit on the edge, ponder the world…with a large wedge of your cake in hand. Welcome back. I would love to visit the Lizard again, it is many years since I was there. Your cake sounds very good, we always used to take a Dundee cake on holiday and a big gingerbread. Wow – that’s either a small plate or a massive cake! (I’m hoping it’s the latter). Looks divine. There are so many things I like about this cake,the hazelnuts, the duck eggs, the apples, the size :-). And the Lizard looks like a gorgeous place too, with so many breathtaking sights. Thanks for sharing your recipe and holiday with us! Looks like a wonderful holiday with fabulous scenery and food. I am impressed that you took a homemade cake with you too. A cake that lasts a week? Surely you jest, I have never heard of such a thing! Beautiful holiday snaps, am very envious. Heart failure aside… what a tremendous cake! Apples, hazelnuts, brandy soaked sultanas AND chocolate? Yes please! Karen – it’s very hard to pick a favourite spot in Cornwall, but the Lizard is certainly one of them. Kath – that dragonfly seemed devoted to CT’s knee. Every time he moved it flew off and then settled straight back there again. The flowers were mostly apple mint growing in vast quantities and montbretia which I picked from the hedges and didn’t have to feel guilty about as they are an invasive species. C – thank you. September is usually quite sunny and calm here in Cornwall, so I was hopeful – hey ho, it was still a good break. Foodycat – thanks, both holiday and cake were indeed good. Katie – apple and hazelnuts are a really good combination. CityHippy – there are some stunning rocks around there. Although to be fair, most of the Cornish coast has stunning rocks. We did momentarily get a scene of beautiful turquoise water that appeared when the mist lifted for a short while but all the more magical for that. Celia – he he, not sure we burned up as much energy as we consumed, but we did get a fair bit of exercise in. There are so many lovely walks around that area. Janice – thank you. I expect you’ve got all sorts of stunning scenery around you too, although it may be a bit warmer on the Lizard. Now you’ve got me thinking about ginger and apple cake …..
Maggie – having a good cake to take with us was part of the fun. KitchenMaid – ha ha, greedy we may be, but sometimes you have to eke out the pleasure. Lizzy – thank you. I have apples spilling from various bags all over my kitchen at the moment!!! I love those photos – and the apple cake – wow. Hazelnuts, chocolate chips, apples – it’s an autumnal masterpiece! What a fabulous coffee cake! Johanna – oh, have you made it? Hazelnuts, apple and chocolate are a lovely combination. Mmmm cake sounds and looks so tasty, i love any desserts/cakes with apples in! Cornwall looks as beautiful as ever too!